I've been quite busy and unable to spend alot of time tatting. 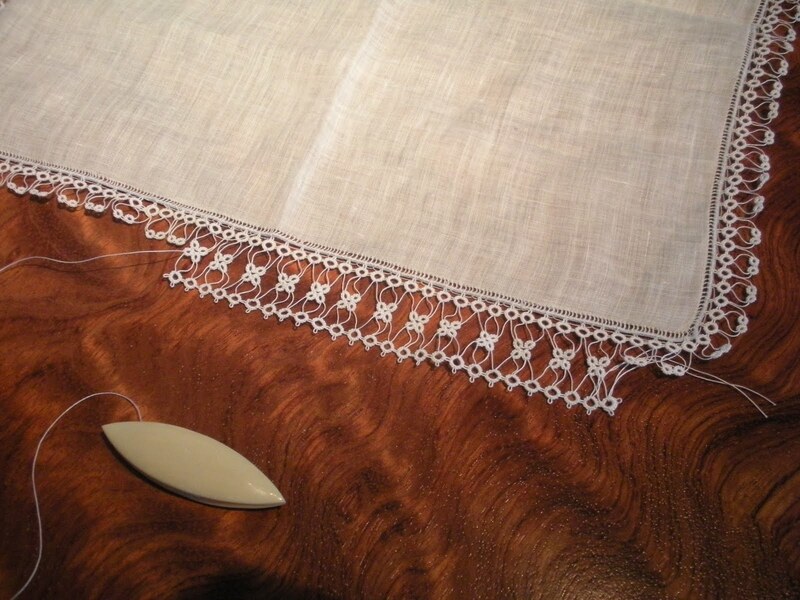 However, I did finish the second round on the wedding hanky. This hanky is for the daughter of one of my co-workers. I was going to add a third round until 'mom' said she liked it just the way it was presented....so, here is the completed project. The corners were challenging. I increased the number of double stitches between the picots by one and added one small ring. The unfinished thread space was the biggest challenge. I learned as I tatted. I will wash, block, and press the linen. The thread is size 80. I'm happy with the final piece. NOW, here is a recent find. I found an abalone shuttle. There is some worn writing on the front. I wanted to show you all to see if you have any information as to the origin of the shuttle. You are able to see the writing in the previous picture and here is the back side. The middle is metal and pictured here. So, what do you think? I haven't used it yet but I'm sure I'll try it out sometime soon. I hope you have a wonderful evening! I've been sitting in a seminar for continuing education credits focusing on couples therapy. The greatest part of the seminar....It's a live video web cast. SO, I get to tat and watch. 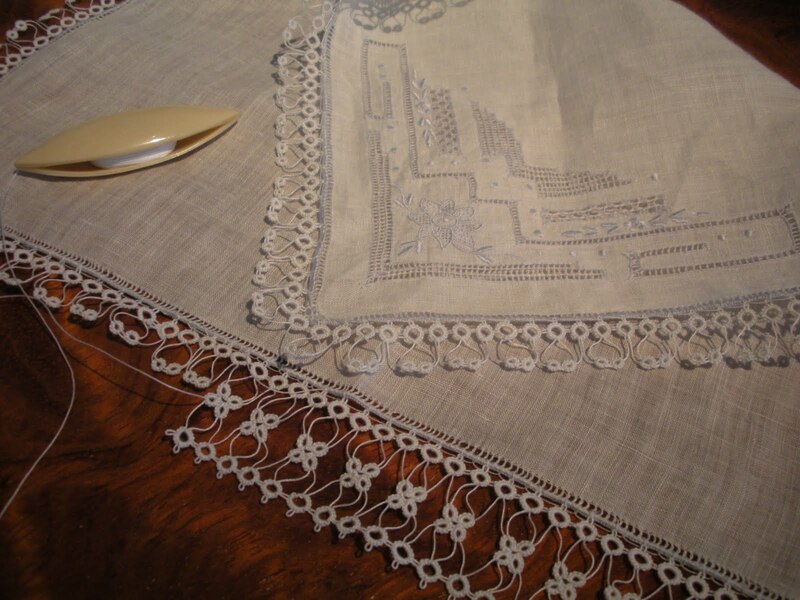 I've been working on the edging and finished attaching the edge to the handkerchief. Now I'm well into round two. 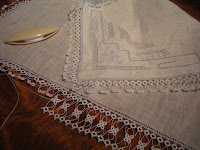 The pattern is from an Anne Orr book. I believe the pattern for this is out there all over..that's just my source. I also wanted to show you all the desk on which I take most of my photos. 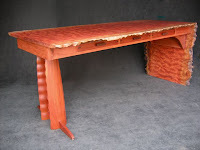 Many have asked over time what piece of furniture this might be...well here it is. After receiving my Ph.D., I gifted myself with this wonderful desk. The artist is Linda Van Gehuchten. She is the premiere, female wood turner in the U.S. and created the desk out of a single piece of bubinga wood. She called me one day with urgency stating, I needed this piece of wood. It is absolutely gorgeous! The grain in the wood undulates in a way that, under the right light, appears to be three dimensional. So, there you have it...just thought I'd show and tell. Now, it's off to 8 more hours of tatting and learning. I hope your day is grand! !